Background and objectives New-onset diabetes and concomitant weight loss occurring several months before the clinical presentation of pancreatic cancer (PC) appear to be paraneoplastic phenomena caused by tumour-secreted products. Our recent findings have shown exosomal adrenomedullin (AM) is important in development of diabetes in PC. Adipose tissue lipolysis might explain early onset weight loss in PC. We hypothesise that lipolysis-inducing cargo is carried in exosomes shed by PC and is responsible for the paraneoplastic effects. Therefore, in this study we investigate if exosomes secreted by PC induce lipolysis in adipocytes and explore the role of AM in PC-exosomes as the mediator of this lipolysis. Design Exosomes from patient-derived cell lines and from plasma of patients with PC and non-PC controls were isolated and characterised. Differentiated murine (3T3-L1) and human adipocytes were exposed to these exosomes to study lipolysis. Glycerol assay and western blotting were used to study lipolysis. Duolink Assay was used to study AM and adrenomedullin receptor (ADMR) interaction in adipocytes treated with exosomes. Results In murine and human adipocytes, we found that both AM and PC-exosomes promoted lipolysis, which was abrogated by ADMR blockade. AM interacted with its receptor on the adipocytes, activated p38 and extracellular signal-regulated (ERK1/2) mitogen-activated protein kinases and promoted lipolysis by phosphorylating hormone-sensitive lipase. PKH67-labelled PC-exosomes were readily internalised into adipocytes and involved both caveolin and macropinocytosis as possible mechanisms for endocytosis. Conclusions PC-secreted exosomes induce lipolysis in subcutaneous adipose tissue; exosomal AM is a candidate mediator of this effect. Unintentional weight loss is observed in patients with pancreatic cancer (PC) beginning several months before the onset of cancer-related symptoms. Weight loss occurs in conjunction with progression of PC-induced diabetes, another recently characterised paraneoplastic effect of PC. Adrenomedullin (AM), a pluripotent hormone secreted by PC has been identified to induce β-cell dysfunction and is associated with PC-induced diabetes. PC-secreted exosomes induce lipolysis in adipose tissue. AM is contained in PC-secreted exosomes. AM containing PC exosomes promotes lipolysis in both murine and human adipocytes and involve activation of mitogen–activated protein kinases. Identification of specific factors contained in pancreatic exosomes and their role in lipolysis will aid in early detection of PC and improve the quality of life of patients with PC. Our goal is to understand the molecular mechanisms of adipose tissue loss in PC in order to develop novel strategies for prevention, which could lead to significantly improved survival rates for PC. Early weight loss in PC begins many months prior to the onset of cachexia.5 This weight loss is paradoxically associated with development of new-onset diabetes5 and is likely due to loss of adipose tissue, as it is not associated with any symptoms of muscle loss, a hallmark of cachexia. We proposed that new-onset diabetes and the associated weight loss in PC are paraneoplastic phenomena caused by tumour-secreted products.5 ,6 A number of candidate ‘lipid-mobilising factors’ in PC have been proposed. However, blood levels of these factors, such as tumour necrosis factor-alpha (TNF-α)7 ,8 and interleukin-6 (IL-6),9 are not consistently elevated in all patients with PC. We, therefore, sought to determine how PC causes fat loss. Our study is based on the novel premise that the effects of PC on remote tissues, including adipose tissue, are mediated by exosomes shed by PC. Extracellular vesicles (EVs) are membranous vesicles that are secreted from a variety of different cell types. There are three classes of EVs: microvesicles, apoptotic blebs and exosomes. Exosomes (30–150 nm), the smallest of the three are shed in large numbers by tumour cells into conditioned media and plasma.10 ,11 We have identified exosomes in conditioned media from PC cell lines, primary PC cell lines and in the plasma of patients with PC. Reports, including ours,12 ,13 suggest that tumour-derived exosomes can effectively target cells through the transfer of their contents (eg, bioactive lipids, receptors, mRNAs, miRNA). Cancer exosomes by virtue of their cargo can have local and systemic effects. Based on our data, we propose that PC-exosomes contain lipolysis-inducing factors that lead to loss of adipose tissue in PC. The exosomal lipolysis-inducing factor that we studied is adrenomedullin (AM), a 52 amino acid peptide ubiquitously expressed in many cells, including adipocytes,14 serves as a modulator of various physiological functions.15 We proposed that tumour-derived AM is a candidate mediator of β-cell dysfunction leading to new-onset diabetes in PC.6 Since diabetes and weight loss in PC are frequent and often occur concurrently, we tested for exosomal AM as a mediator of adipose tissue loss in PC. The role of exosomes in lipolysis and its effectors is unknown. In the present study, we observed that lipolysis in 3T3-L1 cells and in human adipocytes increased upon exposure to PC-exosomes. Increase in lipolysis is attributed to AM contained within PC-exosomes, as ADMR blockade led to abrogation of the effect of exosomes and activation of ERK1/2 and p38 MAPKs in both murine and human adipocytes. Our data support the notion that PC-induced lipolysis is mediated by exosomal AM. All research protocols involving human subjects were approved by Mayo Clinic Institutional Review Board (IRB). Blood collection, tissue sample procurement, handling, processing and storage of samples and informed consents were per Mayo Clinic IRB policies. Subcutaneous adipose tissue was obtained from non-cancer subjects undergoing abdominal surgeries. Normal pancreas sections were obtained from autopsy specimens. Serum samples for exosome isolation and pancreatic resection specimen for cell line generation and immunohistochemistry were obtained under Mayo Clinic Pancreatic Cancer Specialized Program of Research Excellence (SPORE). AM peptide (1–52 AA, Cat# AS-60447) and adrenomedullin inhibitor (AMI) (22–52 AA AM peptide, Cat# AS-60449 receptor antagonist) were from Anaspec. TNF-α (Cat# T0157, Sigma), p38 MAPK inhibitor (SB203580, Cat# BML-E1286-001, Enzo Life Sciences) or MEK1/2 inhibitor (U0126, Cat# 9903S, Cell Signaling). PC patient-derived cell lines were developed from xenografts of PC tissue from resection specimen. The following cell lines have been developed and characterised in our laboratory, as reported previously:19 6741-1 (MCPAN014), 6413-1 (MCPAN013), 5822-1 (MCPAN008), 7135-1, 7426-1, 7291-1. The numbers correspond to unique patient de-identifiers. These were cultured in Dulbecco's Modified Eagle Medium (DMEM)/F12 media. Characterisation of the cell lines 6741-1 (MCPAN014), 6413-1 (MCPAN013), 5822-1 (MCPAN008) includes sequencing and DNA fingerprinting. Cells were grown to 70–80% confluence, washed with PBS and cultured in respective media with microvesicle-free fetal bovine serum for 72 h. Conditioned media was collected, centrifuged twice at 3000 rpm for 10 min at 4°C to remove debris. The supernatant was centrifuged at 100 000×g for 60 min to pellet exosomes. Exosomes were washed in phosphate-buffered saline (PBS) and centrifuged at 100 000×g for 60 min. The pellet was resuspended in PBS. Exosomes from 6 mL of heparinised blood from human subjects were isolated by the same method. Protein concentrations of exosomes were taken using the bicinchoninic acid assay (Pierce). Preadipocytes were isolated from subcutaneous adipose tissue as per protocol20 ,21 and differentiated for 15 days in differentiation media21 with addition of fetuin (1 mg/mL). 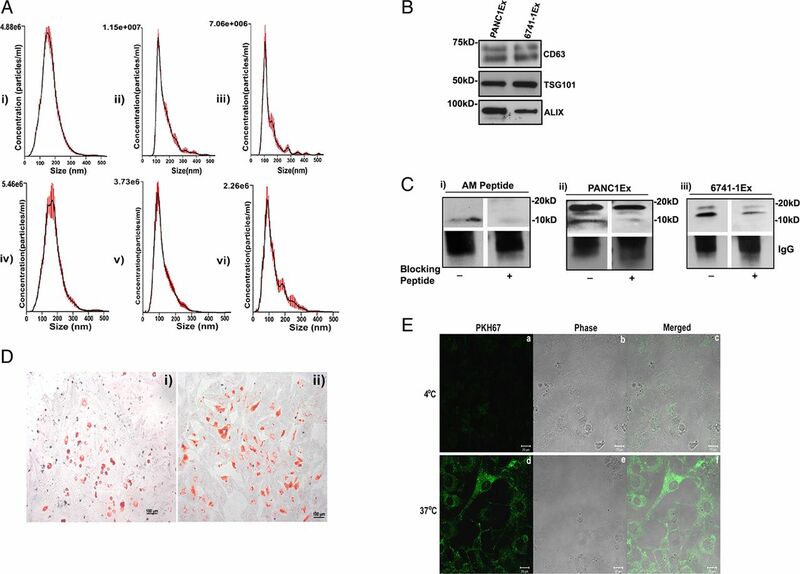 Murine 3T3-L1 preadipocytes were obtained from the American Type Tissue Culture Repository and cultured in DMEM containing 25 mM glucose and 10% fetal calf serum. Cells were differentiated as per Zen-Bio's recommendation.22 Experiments were conducted with differentiated adipocytes (10–14 days). Adipocytes were stained with Oil Red O solution (Sigma).17 Images were taken on Axiovert microscope with a ProgRes C3 camera. Exosome fractions were analysed on the NanoSight NS300. At least 1000 particles were counted (five videos, each of 60 s duration) and analysed with Nanoparticle Tracking Analysis (NTA) V.2.3 software. 3T3-L1 and human adipocytes were seeded in a 12-well plate (∼30 000/well) and differentiated. Cells were treated with 50 µg PKH67 (Sigma)-labelled PANC1 exosomes for 3 h at 4°C and 37°C and imaged using Zeiss LSM 780 confocal microscope. 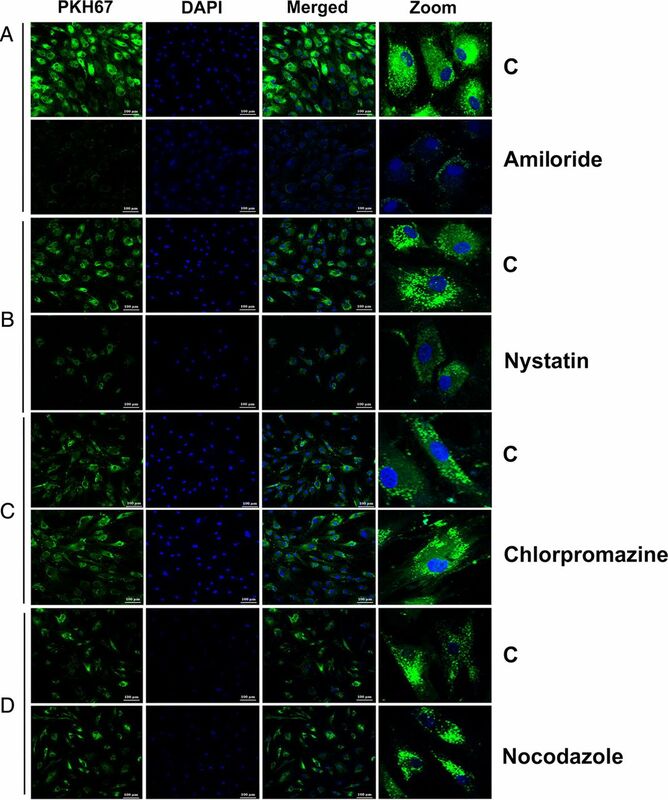 Cell lysates of adipocytes were prepared in NP40 buffer and quantified using the bicinchoninic acid assay. Exosomes were solubilised in NP40 buffer. Each well was loaded with 15 μg protein unless otherwise specified and probed overnight at 4°C with primary antibodies. The following antibodies were used: human adrenomedullin antibody (Phoenix Pharmaceuticals), p44/42 MAPK (Cell Signaling Technology), phospho-p44/42 (Cell Signaling Technology), phospho-p38 (Cell Signaling Technology), p38 (Cell Signaling Technology), HSL (Cell Signaling Technology), phospho-HSL (Cell Signaling Technology), TNF-α (Cell Signaling Technology), β-actin as the loading control (Santa Cruz Biotechnology), p16 (M-156) sc-1207 rabbit polyclonal (Santa Cruz Biotechnology), CA 19-9 (Abcam), TSG101 (Novus Biologicals), Alix (Thermo Scientific) and Anti-CD63 antibody (MEM-259) mouse monoclonal (Abcam). Immunoprecipitation (IP) for AM was performed as per recommendations of Catch and Release V.2.0 Millipore Kit. The exosomes (amount as indicated) were solubilised in NP40 buffer. IP was carried overnight at 4°C and precipitated proteins were eluted under denaturing conditions per manufacturer's protocols. The eluted proteins were run in two parallel sets in the same 4–15% gel—one set was probed with AM antibody (1:1000) and the other set with AM antibody and blocking peptide (AM peptide) preincubated at final concentration of 10 μg/mL with AM antibody for 2 h at room temperature. Duolink fluorescence method was employed as per manufacturer's recommendations (O link Biosciences). 3T3-L1 adipocytes (10 000 cells) were seeded and differentiated in chamber slides. Adipocytes were serum starved overnight (DMEM and 2% Bovine Serum Albumin (BSA)) and treated in microvesicle-free DMEM with 0.5% BSA for 24 h. Human adrenomedullin antibody and CRLR antibody (Santa Cruz Technology, Inc) were used to assess AM/ADMR interactions. Images were taken with Zeiss LSM 780 confocal microscope. Differentiated adipocytes were serum starved overnight in DMEM and 2% BSA (fatty acid free) and treated in microvesicle-free DMEM (phenol red free) with 0.5% BSA for 24 h. Supernatants were assayed for glycerol levels with free glycerol reagent (Sigma) as per manufacturer's recommendations. Immunohistochemistry for AM expression was performed on PC tissues (n=56) and histologically normal pancreas (n=2). Phospho (P)-perilipin expression was done on pancreatic tissues of patients with cancer (n=5) and on histologically normal pancreas (n=3). Human adrenomedullin antibody and anti-phospho-perilipin1 serine 522 antibody (Vala Sciences) were used. Slides were counterstained with haematoxylin and images were taken with Axioplan light microscope (Zeiss). Differentiated human adipocytes serum starved overnight in DMEM with 2% BSA were treated with inhibitors of different endocytic pathways. Cells were then washed with PBS and treated with PKH67-labelled exosomes overnight. Chlorpromazine was used at concentrations of 5, 10 and 20 μM. 5-(N-Ethyl-N-isopropyl) amiloride was used at concentrations of 10, 50 and 100 μM. Nystatin was used at three different concentrations of 10, 27 and 54 μM. Nocodazole was used at concentrations of 1, 5 and 10 μM. GraphPad Prism software was used for all analyses. p Values less than 0.05 were considered statistically significant. Mean±SEM are reported. Student's t test or analysis of variance (ANOVA) with Tukey's post hoc adjustment was used, unless otherwise specified. NanoTracker analysis of microvesicle fraction (isolated as detailed in the Methods section) confirmed size distribution consistent with exosomes (shown in figure 1A: i–iii for exosomes from PC cell lines; figure 1A: iv–vi and online supplementary figure S1A: i for exosomes from PC patient plasma and online supplementary figure S1A: ii from non-PC control subject plasma). Further, exosomal identity markers CD63, TSG101 and ALIX were confirmed by western blot analysis (shown in figure 1B for exosomes from PC cell lines and online supplementary figure S1B for exosomes from patient plasma). Characterisation of pancreatic cancer (PC)-derived extracellular vesicles. (A, i-iii) The size distribution of microvesicle fraction of PC cell lines (n=3) and (A, iv-vi) of plasma from patients with PC (n=3). (B) Western blot showing expression of exosomal markers: CD63, TSG101 and ALIX in PC cell line-derived exosomes (PANC1Ex and 6741-1Ex). (C) Western blot showing immunoprecipitated forms of adrenomedullin (AM) with (i) AM peptide (6 ng), (ii) PANC1Ex (100 μg) and (iii) 6741-1Ex (200 μg). AM peptide is used as a positive control. (+) refers to blocking of AM antibody with (+) and without AM blocking peptide (−). (D) Oil Red O staining of differentiated (i) 3T3-L1 and (ii) human adipocytes. (E) Confocal microscopy showing fluorescence (a,d), phase contrast (b,e) and merged images (c,f) of uptake of labelled exosomes in 3T3-L1 cells at 4°C and 37°C. Immunoprecipitation of solubilised exosomes with AM antibody showed bands migrating to 20 kD and 10 kD in PANC-1 (figure 1C: ii) and to 18 kD and 14 kD in 6741-1 (figure 1C: iii). Each of these bands (figure 1C) was blocked by preincubation of AM antibody with AM peptide prior to exposure, including blocking of the 10 kD band of AM peptide itself (figure 1C: i), confirming the specificity of the bands. In exosomes from PC patient plasma (PC), only mature AM band (10 kD) migrating at the same level as mature AM peptide run as parallel control was detected by immunoprecipitation (see online supplementary figure S1C: i). Similarly, AM band at 10 kD was also detected in exosomes from non-PC control subjects (Control) with levels varying from very low compared with that in PC (see online supplementary figure S1C: i) to comparable level as that in PC patient exosomes (see online supplementary figure S1C: ii). Quantification for AM N≥6 in each group is shown in online supplementary figure S1C: iii, demonstrating increased levels in exosomes from patients with PC. Oil Red O staining of differentiated murine (3T3-L1) and human adipocytes revealed dye-stained oil droplets confirming differentiation of adipocytes (figure 1D: i-ii). Internalisation of PKH67-labelled PC cell line exosomes was observed into 3T3-L1 (figure 1E) and human adipocytes (figure 2G) when imaged at 3 h after treatment with exosomes. No uptake occurred at 4°C. Further, we observed the onset of exosome internalisation in human adipocytes within 15 min of treatment by fluorescent microscopy (data not shown). Adrenomedullin (AM) and pancreatic cancer (PC)-exosomes induce lipolysis in adipocytes. (A) Glycerol levels in 3T3-L1 cells treated with AM (10 nM), tumour necrosis factor-alpha (TNF-α) (50 ng/mL) or AM (10 nM) and TNF-α (50 ng/mL) and compared with untreated cells, C. (B) Glycerol levels in human adipocytes treated with AM (10 nM) or TNF-α (50 ng/mL) and compared with untreated cells, C. (C) Glycerol levels in 3T3-L1 cells treated with exosomes from a commercial PC cell line (PANC1Ex) or PC xenograft cell lines (6741-1Ex, 6413-1Ex, 7135-1Ex, 7426-1Ex and 5822-1Ex) and compared with untreated cells, C. (D) Glycerol levels in human adipocytes treated with PANC1 and 6741-1 exosomes. (E) Western blot showing relative expression of phospho (P)-hormone-sensitive lipase (HSL), P-p38 and P-p44/42 in human adipocytes treated with PANC1Ex with and without adrenomedullin inhibitor (AMI). (F) Western blot showing relative expression of P-HSL, P-p38 and P-p44/42 in human adipocytes treated with AM peptide with and without AMI. (G) Confocal image showing internalisation of PKH67-labelled exosomes by human adipocytes at 37°C. All cells were treated for 24 h with either the lipolytic agent(s) or exosomes. **p<0.01; ***p<0.001; ****p<0.0001. Lypolysis was assessed by glycerol release and western blot of markers of activated lipolysis (phosphorylation of hormone-sensitive lipase (HSL), p38 and p44/42 MAPK). Glycerol assay in the supernatant demonstrated lipolysis in response to AM peptide in 3T3-L1 cells (figure 2A), human adipocytes (figure 2B) to PC-exosomes from various cell lines in 3T3-L1 cells (figure 2C) and human adipocytes (figure 2D). Treatment with TNF-α, a known lipolytic agent, was used as a positive control to validate the assay.23 Further, western blotting of treated human adipocytes demonstrated activation of lipolysis by PANC-1 exosomes (figure 2E) and AM peptide (figure 2F) and inhibition upon treatment with AMI (figure 2E, F). These findings were further confirmed by an increase in free fatty acid levels measured in supernatant after treatment with AM peptide and PC cell line exosomes (see online supplementary figure S2A). No increase in cell death was observed in human adipocytes after treatment with exosomes as confirmed by (3-(4,5-Dimethylthiazol-2-yl)-2,5-Diphenyltetrazolium Bromide) MTT assay (see online supplementary figure S2B). Exosomes from patients with PC activated lipolysis in human subcutaneous adipocytes compared with exosomes from non-PC control subjects as shown by glycerol assay in the supernatants (figure 3A and online supplementary figure S3A) and phosphorylation of HSL and p38 in the treated adipocytes (figure 3B, C and online supplementary figure S3B). As previously shown, AM levels were significantly elevated (1.7±.29-fold) in exosomes from patients with PC compared with those from non-PC control subjects, although some degree of variability was observed between subjects (see online supplementary figure S1C: iii). Further, we observed that patients with PC had a mean excess of 11 billion exosomes per mL of plasma (figure 3D) and a mean excess of 8 µg protein in the exosomal fraction per mL of plasma (figure 3E). Exosomes from patients with pancreatic cancer (PC) activate lipolysis in subcutaneous adipocytes. (A) Comparison of mean glycerol release in human adipocytes treated with exosomes (25 μg) from patients with PC (PC; n=3) and non-PC control subjects (Control; n=3). 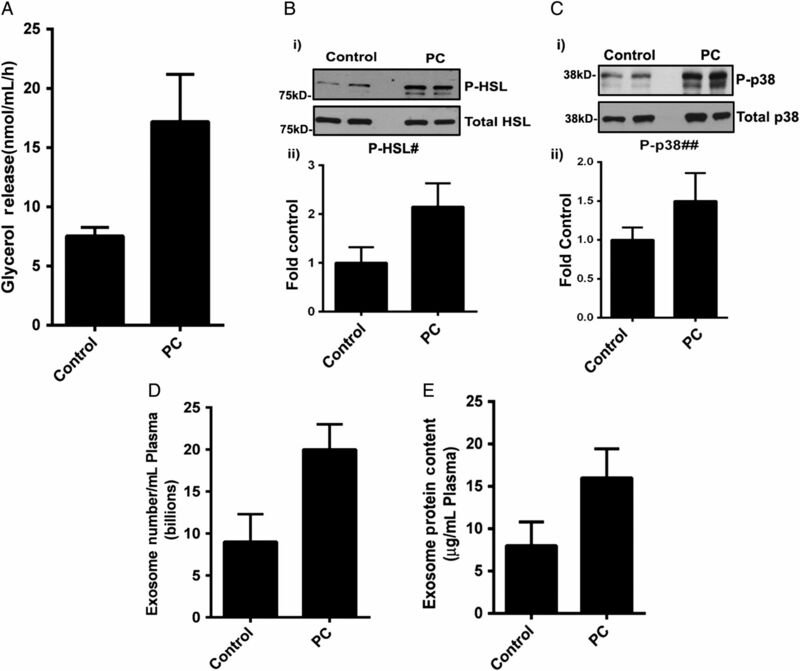 (B, i) Western blot showing expression of phospho-hormone sensitive lipase (P-HSL) in adipocytes treated with exosomes from patients with PC (PC; n=2) in comparison with non-PC control subjects (Control; n=2). (B, ii) Densitometry analysis of mean P-HSL/total HSL band intensity in non-PC control subjects (Control) versus patients with PC (PC) as fold control. #p=0.08. (C, i) Western blot showing expression of P-p38 in human adipocytes treated with PC-exosomes (PC; n=4) in comparison with exosomes from non-PC control subjects (Control; n=4). (C, ii) Densitometry analysis representing mean P-p38/total p38 expression in non-PC control subjects (Control: n=4) versus patients with PC (PC; n=4) represented as fold control. ##p=0.38. (D) Comparison of mean exosome number in non-PC control subjects (Control; n=7) with patients with PC per mL of plasma (PC: n=5, one stage 1, three stage 2 and one stage 4), p=0.03. (E) Comparison of protein content (μg) per mL of plasma in non-PC control subjects (Control: n=5) with patients with PC per mL of plasma (PC; n=7), p=0.09. The Duolink Assay showed increasing AM/ADMR interactions, characterised by red punctate dots, in the presence of increasing amounts of PC-exosomes (figure 4A: ii-iii). PC-exosomes treatment with adrenomedullin inhibitor (AMI) abolished the receptor/ligand interactions, as indicated by less red punctate dots (figure 4A: iv). In addition, treatment with AM and exosomes did not change Crlr and Ramp2 (known components of functional ADMR) expression in 3T3-L1 adipocytes in comparison with control, confirming that the lipolytic effect is due to an enhanced interaction of exosomal AM and ADMR on the adipocytes and not merely due to increase in ADMRs (see online supplementary figure S4A, B). Further, no change in expression of perilipin 1 (PLIN1) was observed on treatment with AM, suggesting lack of effects at the transcription level (see online supplementary figure S4C). Phosphorylation of perilipin is a known initial event in lipolysis pathway. Lipolysis induced by pancreatic cancer (PC) exosomes is dependent on exosomal adrenomedullin (AM). (A) AM/adrenomedullin receptor (ADMR) interactions assessed by Duolink Assay in 3T3-L1 cells: (i) untreated group, (ii) PC-exosomes (5 μg), (iii) PC-exosomes (10 μg) or (iv) pretreatment with adrenomedullin inhibitor (AMI) (1 nM) for 3 h followed by addition of PC-exosomes (10 μg) for 24 h. (B) Glycerol release in 3T3-L1 adipocytes treated with exosomes isolated from a PC cell line (7291-1Ex) with and without AMI (1 nM). (C) Human adipocytes pretreated with AMI (10 nM) for 3 h followed by treatment with PC-exosomes (PANC1Ex) or treated with PANC1Ex alone for 24 h. (D) Glycerol release in human adipocytes treated with AM (10 nM), AMI (1 nM) and AMI (1 nM) and AM (10 nM) for 24 h. (E) Glycerol release in human adipocytes treated with PC patient exosomes (PC), PC-exosomes (PC) with AMI (10 nM), tumour necrosis factor-alpha (TNF-α) (50 ng/mL) and TNF-α (50 ng/mL) with AMI (10 nM) for 24 h. C refers to untreated human adipocytes. **p<0.01; ****p<0.0001. ADMR antagonist abrogated lipolysis in 3T3-TL cells (figure 4B) and human subcutaneous adipocytes (figures 4C and 2E) induced by PC cell line exosomes. In parallel experiments, ADMR antagonist also abrogated lipolysis induced by AM peptide (figures 4D and 2F) confirming that ADMR antagonist was functional in the experimental setting but did not change the lipolytic effect of TNF-α (figure 4E) thus excluding non-specific effects of the antagonist. Similarly, lipolysis induced by PC patient exosome was also abrogated by ADMR antagonist (figure 4E). 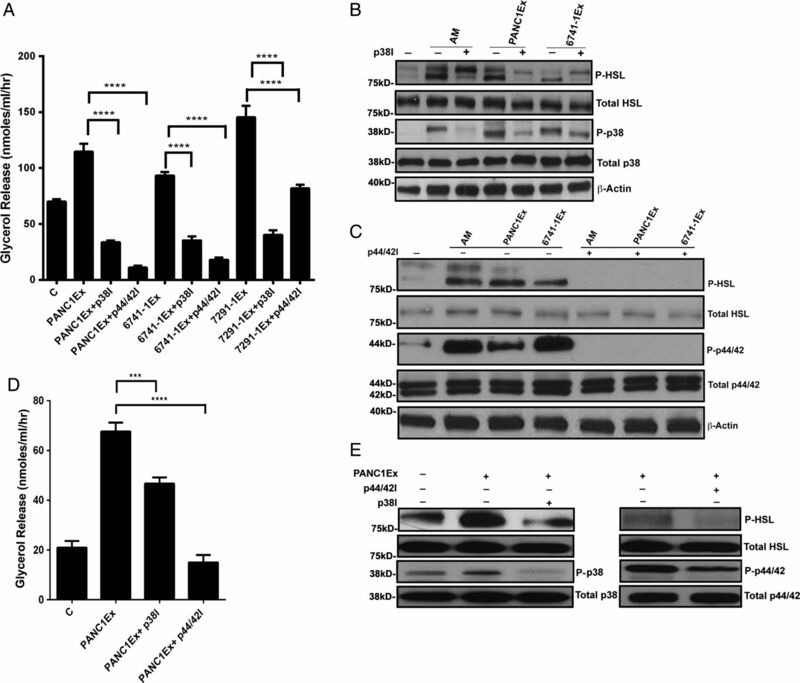 The western blot data (figures 2E-F and 3B-C, online supplementary figure S3B) suggest that lipolysis induced by AM/ADMR interaction involves phosphorylation of HSL. Phosphorylation of HSL is dependent on activation of p38 and p44/42 MAPK/ERK pathways, the known parallel lipolytic pathways in adipocytes. We further tested this possibility by using p38 MAPK inhibitor (SB203580) or MEK1/2 (p44/42) inhibitor (U0126). We observed partial inhibition of lipolysis induced by AM and PC-exosomes in the presence of p38 MAPK inhibitor (SB203580) in 3T3-L1 (figure 5A, B). Near complete abrogation of lipolysis induced by AM and PC-exosomes was observed in the presence of MEK1/2 inhibitor (U0126) in 3T3-L1 (figure 5A, C). Similar results were seen in human adipocytes (figure 5D, E). Additionally, cytotoxic effects of these inhibitors were excluded by MTT assay (online supplementary figure S2B). Lipolytic effect of adrenomedullin (AM) is mediated through mitogen-activated protein kinases (MAPKs) (p38 and ERK1/2) in adipocytes. 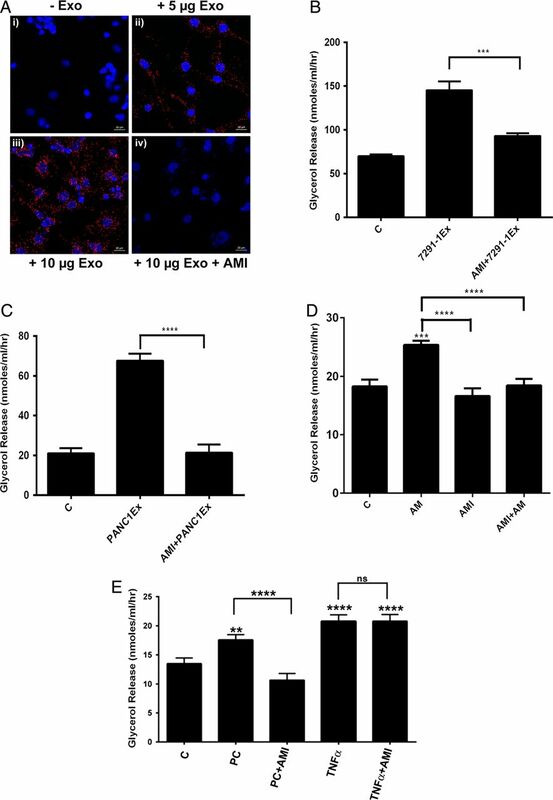 (A) Glycerol release in 3T3-L1 cells treated with pancreatic cancer (PC)-exosomes (PANC1Ex, 6741-1Ex and 7291-1Ex, 50 μg) and inhibitors of the MAPK pathway: p38 inhibitor (p38I; 10 µM), p44/42 inhibitor (p44/42I; 10 µM) and compared with exosomes only treatment group, C refers to untreated cells. ****p<0.0001. (B) Western blot showing phosphorylation of p38 and hormone-sensitive lipase (HSL) in cells treated with p38I and AM (10 nM) or p38I and PC-exosomes (PANC1Ex and 6741-1Ex) for 24 h. (C) Western blot showing phosphorylation of p44/42 and HSL in cells treated with p44/42I (10 mM) with AM peptide (10 nM), p44/42I with PC-exosomes (PANC1Ex and 6741-1Ex) and compared with AM, PANC1Ex and 6741-1Ex treated groups, respectively. + and − refer to treatment with and without inhibitor, respectively. 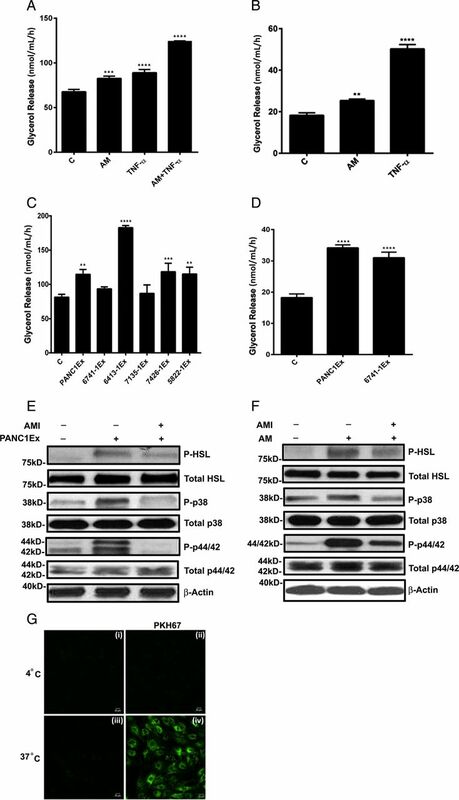 (D) Glycerol release in human adipocytes treated with p38 inhibitor (p38I; 20 µM) and p44/42 inhibitor (p44/42I; 10 µM) for 6 h followed by incubation with PANC1Ex (50 µg) or treatment with PANC1Ex (50 µg) alone for 24 h. (E) Western blot depicting phosphorylated levels of p38, p44/42 and HSL in human adipocytes treated with inhibitor (+) and without inhibitor in the presence (+) and absence (−) of PANC1 exosomes. We measured TNF-α by ELISA in PC cell line exosomes and PC-exosomes from patient plasma to investigate possible confounding of the lipolysis results by TNF-α. As shown in online supplementary figure S5A, in 50 µg exosomes (same amount used for treatment in the lipolysis experiments), TNF-α level was <10 pg. However, no glycerol release was seen at 10 pg or even 100 pg of TNF-α (experiment carried out in 1 mL, same volume as in the lipolysis experiments) but lipolysis was seen at 50 ng of TNF-α (online supplementary figure S5B). This confirms lack of functionality with the levels of TNF-α in PC-exosomes with regard to lipolysis. Immunohistochemical (IHC) staining for AM revealed increased expression of AM in PC in the resection specimens of pancreas from patients with PC (figure 6: ii-iv) in comparison with normal pancreas from autopsy specimens (figure 6: i). Interestingly, phosphorylation of perilipin, an early event in lipolysis, was observed in the peripancreatic adipose tissue in the PC resections (figure 6: vi-viii) but not in the normal pancreas (figure 6: v). Upregulation of adrenomedullin (AM) in pancreatic cancer (PC) resection specimen. Immunohistochemical (IHC) staining for AM in tumour affected pancreatic ducts and cancerous regions in patients with PC (P#1–3, (ii)–(iv)) in comparison with normal subjects (i). IHC staining for phospho (P)-perilipin 1 in lipid droplets of adipocytes of patients with PC (P#1–3, (vi)–(viii)) in comparison with pancreatic tissues from normal autopsies (v); positive staining is represented by arrowheads. Treatment of human adipocytes with inhibitors of various endocytic pathways revealed the involvement of macropinocytotic-dependent and caveolin-dependent mechanisms for internalisation of PKH67-labelled exosomes. Treatment with an inhibitor of micropinocytosis (amiloride, 50 µM) for 30 min inhibited the uptake of PC-exosomes (figure 7A). Treatment with an inhibitor of caveolin/lipid raft-mediated endocytosis (nystatin, 54 µM) for 30 min also inhibited the uptake of PKH67-labelled exosomes in comparison with control (figure 7B). In contrast, treatment with an inhibitor of clathrin-mediated endocytic pathway (chlorpromazine, 20 µM) for 30 min and a microtubule destabilizer (nocodazole, 1 µM) for 10 min did not significantly affect the internalisation of labelled exosomes compared with the untreated control group (figure 7C, D). Thus, macropinocytosis and caveolin/lipid raft-mediated endocytosis are most likely the mechanisms for internalisation of exosomes into adipocytes. Macropinocytosis and caveolin-mediated endocytosis of pancreatic cancer-exosomes in adipocytes. Confocal images (20×) of differentiated human adipocytes pretreated with various inhibitors of endocytic pathways and incubated with labelled PANC1Ex for overnight at 37°C. (A) Amiloride (50 μM; 30 min), (B) nystatin (54 μM; 30 min), (C) chlorpromazine (20 μM; 30 min) and (D) nocodazole (1 μM; 10 min). C refers to treatment with labelled exosomes only. Based on our clinical observations, we postulated that in patients with PC, tumour-secreted products mediate a paraneoplastic phenomenon that results in early, pronounced, unintentional weight loss, primarily the loss of adipose tissue.5 Tumour-derived exosomes have been shown to play a role in tumour progression and transport cargo that can profoundly influence remote tissues.24 Therefore, we examined the role of PC-exosomes and their content as potential mediators of lipolysis. In this report, we show that exosomes released by PC contain AM that induces lipolysis in subcutaneous adipose tissue. Due to its known involvement in new-onset diabetes, a paraneoplastic syndrome in PC,5 ,6 ,19 we examined the role of AM in cancer-associated lipolysis. AM has been found to have varied effects on lipolysis depending upon the cellular context. In the murine cell line 3T3-F442A, AM failed to promote lipolysis;25 however, in rat adipocytes, AM promoted lipolysis by increasing phosphorylation of HSL.17 In our study involving murine and human adipocytes, we observed that both recombinant and exosomal AM promoted lipolysis through activation of p38 and p44/42; this effect was abrogated with AMI treatment. Our data convincingly demonstrate that PC-exosomes induce lipolysis and this effect is abrogated by ADMR blockade, suggesting that PC-exosome-induced lipolysis is dependent on exosomal AM. Further, we show that PC-exosomes do not contain functionally significant TNF-α, a well-known lipolytic factor. We acknowledge that additional lipolytic mechanisms such as IL-6 and other known factors might be operational in PC-induced lipolysis either independently or in conjunction with PC-exosomal AM. Exploring all such mechanisms is beyond the scope of this manuscript and future studies will be needed. However, in this study, we describe a novel mechanism of PC-induced lipolysis that is mediated by PC-exosomes and is exosomal-AM dependent. Our data show that AM levels in PC-exosomes from patient plasma are elevated compared with exosomes from non-PC control subjects, although we observed some degree of variability in the levels between subjects. In addition, we found that the total number of exosomes is much higher in PC plasma compared with non-PC control subjects, although this needs to be further confirmed among other control groups with chronic pancreatitis. However, we believe that taken together, these might explain the significantly increased lipolysis in patients with PC but not in non-PC controls. In addition, possible mechanisms targeting exosomes from PC to adipocytes might exist such that PC-exosomes have higher potency and efficacy in the pharmacological sense for lipolysis compared with control exosomes. Exosomal tissue targeting and selective uptake mechanisms are poorly understood and future studies will be required to explore such possibilities. Western blot analysis of PC cell line-derived exosomes showed multiple bands, including bands at ∼22 kD seen consistently and variably at 18 kD, ∼14 kD and 10 kD (data not shown), suggesting the possibility of multiple processed forms of AM (based on predicted molecular weights—185 AA PreproAM (22 kD), 164 AA ProAM (18 kD), intermediate form of AM ∼14 kD and 52 AA mature AM (∼10 kD)). We were able to eliminate non-specific bands observed in traditional western blot by resorting to immunoprecipitation. Detection of variable precursor forms of AM in lysates from various cancer cell lines26 and variability based on the processing of the samples have been reported previously. Whether detection of various forms of AM suggests that packaging of AM in different forms in the exosomes is perhaps dependent on the cellular conditions and/or existence of possible mechanisms of post-translational modifications that could process precursor forms to mature forms of AM is only speculative at this time. Interestingly, in exosomes from human subjects, we consistently observed only the mature AM band at 10 kD. We observed that recombinant AM and exosomal AM mediate their effects through interaction with ADMRs on adipocytes. A functional ADMR contains a member of the seven transmembrane domain G-protein-coupled receptor superfamily named calcitonin receptor-like receptor (CRLR) and one of the three single transmembrane domain-bearing proteins RAMPs (RAMP1/2/3) as coreceptors. RAMPs associate with CRLR in the endoplasmic reticulum and are transported to the plasma membrane.27 In pancreatic adenocarcinoma, there is a strong colocalisation of CRLR with RAMP1/RAMP2 but not with RAMP3, suggesting that RAMP1/2 but not RAMP3 are the main coreceptors for CRLR in pancreatic adenocarcinoma.28 The Duolink Assay System29 not only revealed the interaction of exosomal AM with the ADMR, but also validated the role of exosomal AM in lipolysis. Since the Duolink Assay indicated that AM/ADMR interactions occur inside the cell, we also examined the mechanism of exosome internalisation in adipocytes. Exosomes can be internalised via different mechanisms, including macropinocytosis, clathrin-mediated or caveolin-mediated endocytosis or phagocytosis.30–32 The method of exosome internalisation can vary depending on their content, size, their fate after internalisation and the signalling status of the cells.33 We tested inhibitors of various endocytic pathways and found caveolin-mediated endocytosis and macropinocytosis as possible mechanisms for exosome internalisation in adipocytes (figure 7). Our data suggest that there are several means of exosome internalisation and their association with various endosomal compartments. In summary, our data demonstrate that PC-exosomes induce lipolysis in murine and human subcutaneous adipocytes. Further, PC-exosomes contain AM that interacts with ADMRs on adipocytes. The lipolytic effect of exosomes was abrogated by ADMR blockade. Together, these data show that PC-exosome-induced lipolysis is mediated by exosomal AM. Our results strongly support the notion that early onset weight loss observed in patients with PC preceding the onset of PC-related symptoms is due to PC-induced lipolysis mediated by exosomal AM. We believe this work provides insight into early onset paraneoplastic effects of PC; further research in this area will be crucial in identifying targets and developing strategies for early detection of PC. The authors would like to thank James Tarara and Kristin Mantz of Mayo Clinic Microscopy Core for assistance with microscopy work, Dr Ying Wang for assistance with immunohistochemistry and Dr Krishnendu Pal for assistance in experimental design.
. Serum levels of tumor necrosis factor-alpha and nutritional status in pancreatic cancer patients. Anticancer Res 2001;21:1355–8.
. Adrenomedullin, a multifunctional regulatory peptide. Endocr Rev 2000;21:138–67.
. Resveratrol potentiates genistein's antiadipogenic and proapoptotic effects in 3T3-L1 adipocytes. J Nutr 2007;137:2668–73.
. The vasoactive peptide adrenomedullin is secreted by adipocytes and inhibits lipolysis through NO-mediated beta-adrenergic agonist oxidation. FASEB J 2005;19:1045–7.
. In situ proximity ligation assay for microscopy and flow cytometry. Curr Protoc Cytom 2011;56:9.36:9.36.1–9.36.15. RPS and NJ contributed equally in the manuscript. Contributors GS conducted experiments, generated data and wrote manuscript. RPS conducted experiments. NJ edited manuscript and formatted figures. SKD and NJ did western blots. TCS took and analysed pictures of IHC staining for adrenomedullin and P-perilipin in pancreatic tissues. JSL and SKD generated PC patient-derived cell lines. NG provided human preadipocytes from subcutaneous depot. JLK reviewed the manuscript. STC edited the manuscript, discussed and reviewed the results. DM directed and supervised the study. Funding The study was supported by CA78383, CA150190 and Florida Cancer Research Chair Fund (Florida #3J) to DM, CA100685 to STC and supported by NIH Training Grant 5T32CA148073-05 to GS and NJ.